Coheteboy is back with another great guest review - take it away! The Masters of the Universe toy line is still going strong with the addition of a few new evil warriors to help the forces of Skeletor battle the likes of He-Man and his heroic masters. Among the latest of these villains is the evil tail-thrashing warrior himself, Whiplash. Just like the original Whiplash figure, his main function is to cause lethal blows with the power of his tail. Look out, He-Man! The packaging has remained the same from the beginning of the line with its standard card and bubble. Different this time around is a slight color change on the lower part of the card from red to purple. This is actually a very nice touch since it makes the overall product stand out a bit easier, especially if you're looking for the new figures only. It is uncertain if the good guys will have the same standard red blisters, but we will all find out soon enough. The back of the blister still gives details on how the toy works along with other specifications. The bubble is strong and sturdy and a "Masters of the Universe" sticker is still included with the figure. Like the other villains in the line, Whiplash is presented to us with a new sculpt that blows the original out of the water. While the others appeared to be modern improvements, Whiplash here seemed to have received a complete major overhaul. If any of you remember the vintage Whiplash back in 1984, you will probably recall one of the ugliest creatures ever produced. And not a "cool" kind of ugly, mind you, it was a "pathetically sad" kind of ugly. The NEW Whiplash is now a lean, mean, fighting machine - if we're to judge it all on looks alone. This has got to be one of the best sculpts from the Four Horsemen to date. The detailing in the scales and armor that cover the entire body are truly amazing and the facial expression is absolutely perfect. One minor problem (for a few of you) is that Whiplash's right hand is made to hold his weapon while the left hand is sculpted into a fist. I know some collectors who dislike having unusable hands but it at least looks good! Fans who are considering quitting on this line just might change their mind after seeing this menacing figure. There isn't too much here in the paint department, which is a real shame because it would have added so much more to the incredible sculpt. There are different shades of green in the upper body and the tail but the legs would have definitely looked better had there been more than one shade of green. Whiplash's eyes are well done but I've found that the teeth are inconsistent and sometimes sloppy. Another disappointment, and this is a pretty big one for me, is the upper part of the tail stub that is sculpted into the figure. This part should have been painted green so the tail whip would be uniform when attached, but is instead painted the same dark blue as his quilt. It's really too bad when a detail like that is missed, especially when the prototype was painted accurately. 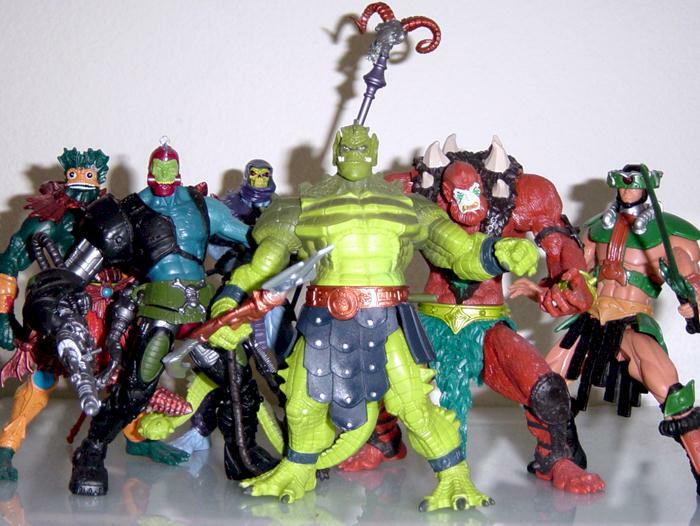 Whiplash has the same amount of articulation as the other MOTU figures which is always a decent amount. Then throw in an additional point for the tail. The usual joints include the neck, two in each shoulder, wrists, waist, and two in each hip/leg. More on the tail below. Whiplash comes with two accessories. One is a Trident Staff and the other is his Tail Whip that attaches and becomes a part of the figure. The staff looks great and features three colors but is probably one of the most disappointing items in the set. The handle is required to be pushed through a hole in the right hand but due to the soft rubber used for it, it's pretty much impossible to do so. The tail whip is basically meant to be a part of the figure, sculpted with as much attention to detail and painted with two different shades of green. The difference between this and the vintage Whiplash is that the older version was given a rubber tail to trip enemies while the new tail is the same plastic used for the figure. Whiplash's action feature is none other than a thrashing tail, achieved by a peg sticking out of the left side of the waist. Pushing the peg causes the tail to swing to the opposite side, releasing the peg sends the tail back. Though the peg is distracting, it works very well. The original Whiplash feature was to rotate the upper torso and release, sending the rubber tail thrashing along. I'm not certain which way is the more effective, but the new Whiplash will certainly be a threat to friends of He-Man. MOTU figures are usually around $7.99 or $8.99 and it's well worth it for the scale and amazing sculpt. This figure was VERY close to recieving a perfect score but an unpainted tail and a gimpy weapon handle definitely leave more to be desired. Still, Whiplash is an awesome addition to the Masters of the Universe line-up with one of the most amazing sculpts around. The figures seem to get better and better with each wave so don't hesitate to pick up this reptile when you see it! Target and Wal-Mart stores are the only locations I have seen the latest waves appear, but Toys'R'Us will probably be receiving some in the future.